The leaders of Austria-Hungary held Serbia responsible for Archduke Francis Ferdinand’s death in a terrorist attack in 1914. The leaders of Austria-Hungary hoped to rally the citizens of their fading empire by going to war against the much smaller Serbia, believing a victory would remind their ethnic minorities of the empire’s strength, and let other ethnic groups know that terrorism would be punished. Wars are expensive, but they can also help an economy. Workers throughout Austria-Hungary went to work in factories creating weapons. Others toiled to feed and clothe the soldiers. What Austria-Hungary did not count on was fighting two nations. Russia has a large Serbian minority and many ties with Serbia and the other nations in the Balkan mountains. Russia was displeased with Austria-Hungary’s seizure of Sarajevo and did not want Austria-Hungary expanding into the Balkans. So Russia agreed to join Serbia if Austria-Hungary attacked. Austria-Hungary had a military alliance with Germany. An alliance is an agreement to act together. 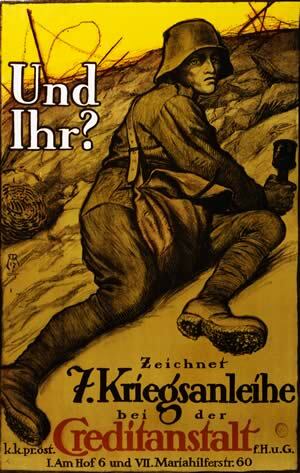 When Austria-Hungary declared war in July 1914, Germany joined the fight against Serbia. The people of France hoped to relive the glory days of Napoleon, a period when France briefly controlled most of Europe. The French were eager to reclaim land ceded to Germany in a small conflict 44 years earlier. France had an alliance with Russia, so the French prepared to join the conflict. 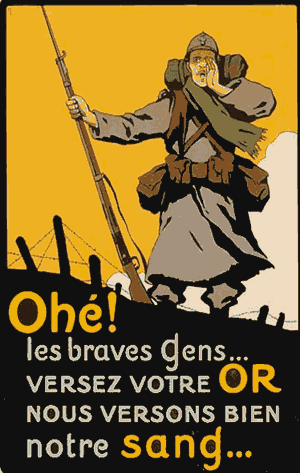 French poster asking people to support their troops by purchasing war bonds. And you?" asks the poster imploring the people to support their soldiers by purchasing war bonds."